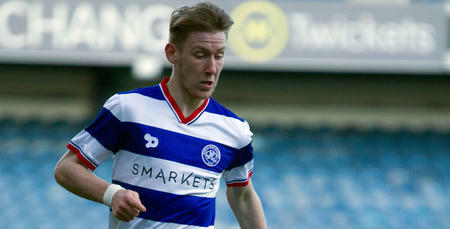 QUEENS Park Rangers fine form continued with a comfortable 2-0 victory over Millwall at Loftus Road. Two quick first-half goals from Massimo Luongo and Eberechi Eze was enough to give the Hoops a convincing win. The result lifts Rangers up to 16th in the Championship and means the R’s have picked up 10 points from a possible 12 in the last four matches. Steve McClaren opted to make one change for the London derby. Geoff Cameron came in for his full debut and replaced the fasting Tomer Hemed who dropped to the bench. That meant the R’s lined up with Joe Lumley and in front of him a back four of Angel Rangel, Captain Toni Leistner, Joel Lynch and Jake Bidwell. Cameron lined up alongside Massimo Luongo in the middle of the park with Jordan Cousins and Luke Freeman playing either side of them on the flanks. Saturday’s match-winner Eberechi Eze was deployed in a more central role, playing just off Nakhi Wells. Our visitors also opted to make one change. 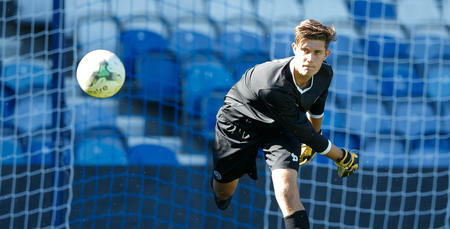 The influential Steve Morison was dropped to the bench and summer signing Thomas Bradshaw made his first league start. QPR had the chance to get off to a perfect star when Eze drew an early foul at the edge of the box. After much discussion it was Wells who took the set piece but it was never in any danger of troubling Ben Amos in the Millwall goal. In the 6th minute QPR had a strong shout for a penalty turned down. A nice move down the right-hand-side saw Eze’s cross just evade Wells in the middle. The move wasn’t over and the ball found Bidwell on the left who hit a cross that looked to have struck the hand of Jed Wallace, but referee Rob Jones waved away the strong appeals from the R’s. QPR had certainly enjoyed the better start but were wasteful with a few set-pieces that came their way in the opening 20 minutes. In the 28th minute patient QPR build up saw a good opportunity created for Jordan Cousins. After a nice spell of possession Wells unlocked the defence with a cute through ball and Cousins drew a good save from Amos. The resulting corner would give the R’s a deserved lead! Freeman’s clever cut back saw Wells in space and the loanee’s deflected shot fell into the path of Luongo who headed past Ben Amos from close range to put McClaren’s side one up. Two minutes later it was 2-0 and QPR were cruising! Wells won the ball in midfield and drove forward putting in a cross that was headed away but Bidwell did well to keep the move alive. He found Eze and the former Millwall man’s deflected left-footed volley bounced over Amos and gave him his third goal of the season. Loftus Road was buzzing! Millwall’s first chance of the game didn’t come until the 43rd minute. 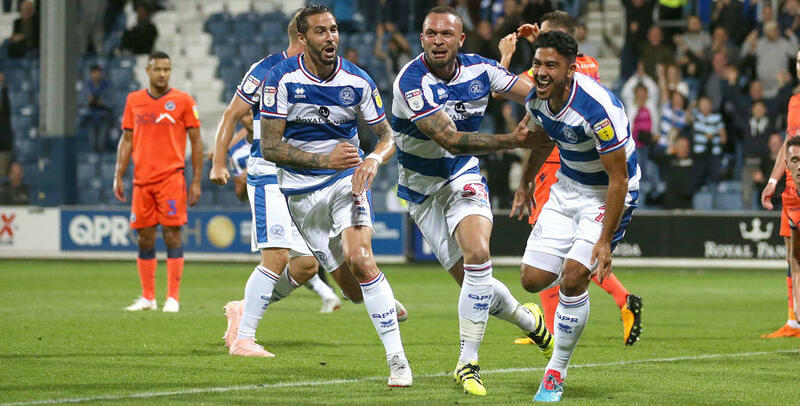 QPR dealt with a series of long balls, but then switched off to one that found the towering centre half Jake Cooper and he flicked the ball into the path of Aiden O’Brien who fluffed his lines from close range. The R’s went into the half-time break having produced unquestionably their best 45 minutes of the league season. Neil Harris unsurprisingly chose to bring on Steve Morison at half time replacing the ineffective Tom Bradshaw. And in the 50th minute he was almost rewarded when the big target man forced Lumley into a smart save. 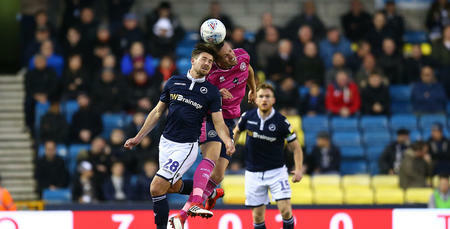 Millwall then went inches away from reducing the deficit when Jake Cooper headed Wallace’s corner against the bottom of the crossbar, but then crucially safely into the hands of Lumley. It seemed the Lions had awoken following what was undoubtedly a stern telling off from the Millwall gaffer at the break. There was now a lovely flow to the game with Millwall getting more and more men forward but QPR looked dangerous on the counter-attack. On the 55th minute the impressive Wells brought a good low save from Amos, and Bidwell also went close from a tight angle. The R’s were having to deal with an aerial bombardment from the visitors with Morison causing all sorts of problems. He perhaps should have done better when a difficult chance fell his way six yards out. With 20 minutes remaining McClaren made his first sub of the game, taking of Wells and bringing on Hemed. The R’s were struggling to find the same rhythms as they had in the first half but Millwall deserved some credit for a much improved display. In the 77th minute QPR almost sealed the game in sublime fashion. A splendid flick from Eze put Luongo through on goal but Amos denied him with a low save and Cousins follow up was cleared off the line from Jake Cooper. With ten minutes to go Josh Scowen replaced the lively Luke Freeman as Rangers looked to preserve their lead. However it was QPR who went closer to scoring when Hemed took a lovely free-kick from 30 yards which Amos somehow got his hands too. In the final moments Millwall had one last chance when Jed Wallace fired over from the edge of the box but the R’s deserved their clean sheet and the three points for a fine evening’s work. 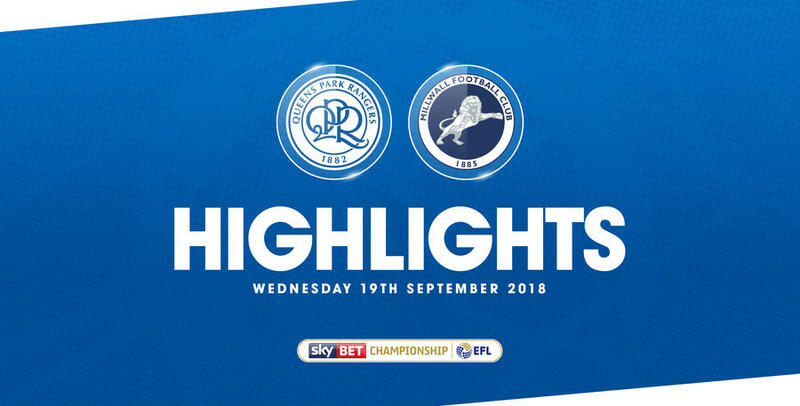 WATCH highlights from QPR’s 2-0 win against Millwall at Loftus Road on Wednesday night.